Spring Back to Harvard is a new series of events sponsored by the HAA and taking place across the globe this spring. These events aim to reconnect Harvard grads and their families with local Harvard alumni through fun, family-friendly activities, with a focus on alumni between six and twenty-five years after graduation (but all alumni are welcome!). Regular public transport links serve the attraction and a shuttle bus from Watford Junction train station is available, costing £2.50 per return journey. If you are using a satellite navigation system, please use 'Warner Bros. 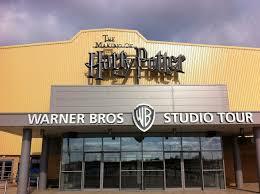 Studio Tour London' or 'Studio Tour Drive' when setting your destination. Please note, our postcode - WD25 7LR - may not work on some systems as it's still a relatively new site. We will send out details on where to meet the group closer to the time of the event. On 31st March, the studio will unveil an exciting, permanent expansion dedicated to the Forbidden Forest. The Forbidden Forest may be strictly off-limits to Hogwarts students, but for the first time this March, you are invited to defy Professor Dumbledore’s orders and follow the footsteps of Harry, Ron and Hermione deep into the grounds of the Forbidden Forest.